More than two years after Superstorm Sandy, there are still thousands of houses that need to be rebuilt for families can return home. Last summer, victims were upset when a no construction during the summer policy was enforced. This rule was to benefit tourists and others visiting the shore during the summer months. Officials did not want visitors to have to deal with the noise and inconvenience of construction. But what about the families of these homes? Why are we not thinking about how inconvenient it is for them to still not have a place to call home. New Jersey Senate President Stephen Sweeney is focused on passing legislation to help these families. He is introducing a bill that will help Sandy victims financially as well as increase standards and safeguards to protect them. The overall goal is to speed up the recovery process. If you and your family have been a victim of Superstorm Sandy and are still trying to recover, we’re here to help you. Penn Jersey can provide many benefits to your storm recovery in NJ so if you’re looking for any of the below qualities, give us a call. RREM stands for Reconstruction, Rehabilitation, Elevation and Mitigation. 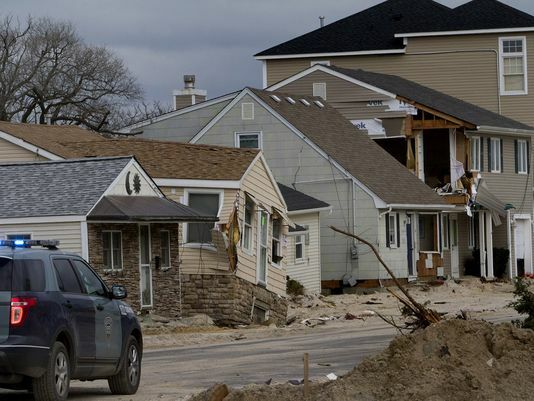 The state of New Jersey established the RREM program to assistant Sandy victims financially. Providing funds to victims helped them rebuild quicker. Additionally, the RREM program comes with a list of pre-qualified FEMA approved contractors. Penn Jersey qualifies as a RREM contractor making us the perfect contractor to build your new home. After Superstorm Sandy, many families have decided to elevate their home. There are several reasons for doing this. The first is that it will protect you from future floods. Living at the shore or by any body of water puts you and your home at risk. 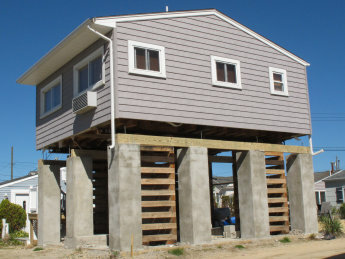 By elevating your home above flood levels, your home has a better chance of surviving the flood. Lifting your home also has financial benefits. Because your home is now above flood levels, its risks of being damaged are significantly lower. This will help reduce your insurance rates and increase the value of your home. Additionally, the views from your lifted home will be beautiful. We are custom home builders for the state of New Jersey. We know what works here and what residents want most from their homes. We will help you get what you want and need from your new home. We work with you to decide what works best for you and your family as well as your budget. When you build a custom home, you’re getting exactly what you want. Plus we understand and are familiar with New Jersey flood zones and can help you stay within regulations. We know how difficult storm recovery has been for residents of New Jersey and we want to help. No matter what your situation is, we are here to listen, advise and build when necessary. We know all the restrictions and regulations for new homes being built in flood zones. Stay out of danger and stay safe during the next storm. You’ve waiting long enough for your new home to be built – give us a call to get started or continue your storm recovery.